Leading market analysis firm Transparency Market Research has announced the release of a new research report. The report, which studies the global microencapsulation market to present analysis of its current and past figures, states that the global microencapsulation market is expected to grow almost twofold from a valuation of US$4.7 bn in 2013 to US$9.1 bn in 2020. This represents a CAGR of 9.70% from 2014 to 2020. The report is titled ‘Microencapsulation Market - Global Industry Analysis, Size, Share, Growth, Trends and Forecast, 2014 - 2020’. Microencapsulation is a technology that allows packaging chemically active ingredients in protective shells. These shells facilitate slow and sustained release of the ingredients. The ingredients may be of several types, depending upon the end-use industry. In pharmaceutical products, microencapsulation is used to enclose the active pharmaceutical ingredient. This facilitates sustained release of the API, boosting its effectiveness. 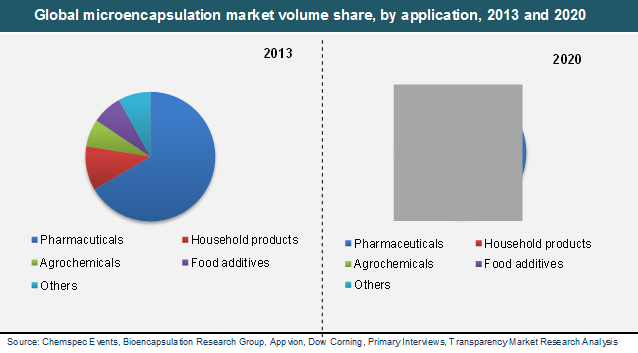 Pharmaceuticals dominate demand for microencapsulation, accounting for 65% of the global market in 2013. Other than the pharmaceuticals industry, household products, food additives, commodity and special industrial chemicals, and agrochemicals were the major application segments of the global microencapsulation market in 2013. In the forecast period, household products are expected to have steady demand for microencapsulation, since it helps make detergents and other cleaning agents more efficient and effective. Food additives are also expected to rise in demand over the coming years. Major subcategories within food additives that employ microencapsulation are dietary supplements and prebiotics. Due to the slow and sustained release achieved through microencapsulation, dietary supplements and prebiotics become more bioavailable once ingested. This boosts their utility, thus helping demand from the global microencapsulation market. The rise in demand for microencapsulation from the aforementioned end-use industries is aided by the overall rise in the spending power of customers. Innovation in the pharmaceuticals industry has been on the rise due to rising demand for more effective pharmaceutical products, while the rising amount of disposable income in developing countries has allowed more customers to purchase dietary supplements on a regular basis. This has helped the global microencapsulation market massively. North America and Europe, housing some of the most highly developed countries in the world, lead demand from the global microencapsulation market. The high purchasing power of customers in developed countries and their increasing inclination towards healthy dietary choices are propelling the microencapsulation market in these regions. However, growing prevalence of these two factors, along with a rapidly rising pharmaceutical industry in response to increasing disease outbreaks, is helping the Asia Pacific market post strong growth figures. Apart from regional and application analysis, the report on the global microencapsulation market also helps readers understand the competitive landscape of the market, profiling major companies such as Dow Corning Corporation, Capsulae, Reed Pacific, Encapsys, Bayer AG, 3M, Evonik Industries AG, Aveka, Inc., Microtek Laboratories, Inc., Taste Tech Ltd., Lipo Technologies, and BASF S.E.